focusbase is another advertising-supported application which might enter your system with a help of freeware and then start showing various commercial ads on such websites as bestbuy.com, amazon.com, walmart.com, and similar. You might not even suspect that all these ads might expose you to threats because they seem extremely useful. However, you will soon find out that they are very intrusive and thus might interfere with your browsing activities. As this advertising-supported application is compatible with all the browsers, you will not be able to stop these commercials from appearing unless you delete focusbase from the system. Continue reading the article and find out how to do that. This advertising-supported application is published by Super Web LLC, which is known for a bunch of advertisements, including Cling-Clang, Surftatic, Fortunitas, and the like. Neither the aforementioned programs nor focusbase are going to act in a beneficial way, which is why it is advisable to get rid of them as soon as possible. If you still decide to keep focusbase onto your computer, you should know that you can infect your system with malicious software very quickly – it might be enough to click on any of those advertisements once. What is more, advertising-supported applications tend to record information associated with your activities on the web, which means that your search queries, the websites that you visit, and similar information will be recorded unless you delete focusbase from the system. It is not worth expecting that focusbase will enhance your browsing experience as promised or act in a very useful way. Actually, you should not expect much from all adware programs because they have more drawbacks than benefits. In order to avoid suspicious programs in the future, you should download and install programs, for instance, freeware very carefully because adware programs tend to travel bundled with additional applications. Of course, if you want to be completely safe, the only trustworthy method is to keep a reliable tool enabled all the time. 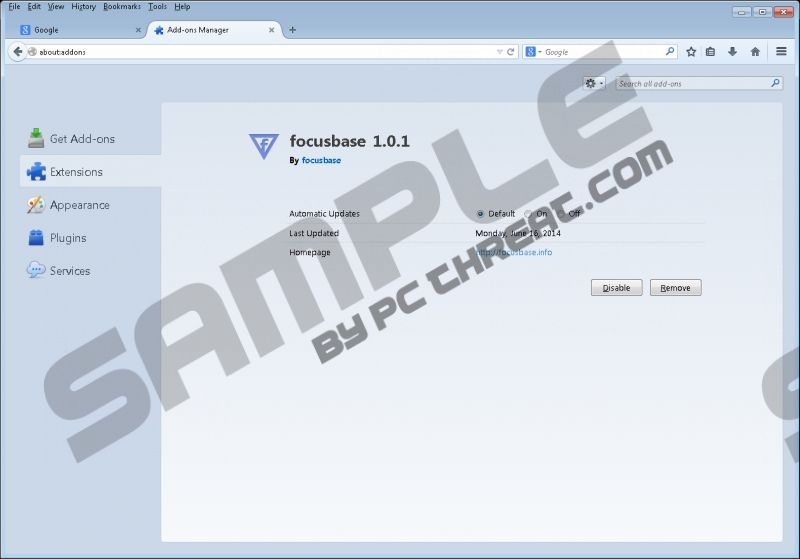 If you have already noticed that focusbase has infiltrated your system, you should delete it as soon as possible. The easiest way to do that is to scan the system with a reliable antimalware tool, for instance, SpyHunter. However, you can also delete this program manually as well, especially if you have some previous experience in malware removal. The instructions provided below the article will help you to get rid of focusbase entirely. Locate the program that needs to be erased. Quick & tested solution for Focusbase removal.